I absolutely love to teach, I'm realizing that more and more. Passing on knowledge and sharing what I'm passionate about is such a gift. I can see that as I offer the part of myself that lives in that ecstatic state of creativity, what I'm really engaging in with students is our common humanity. A big part of teaching is realizing as well, that we are the student as much as we are the teacher. Technical information is important no doubt, but what people remember far more than anything are those inspiring words of guidance that get them through their darker days. That is what I remember most from my great teachers. Not necessarily what they taught so much as the smile, the encouragement, their belief in my inherent success...those are the values that I believe will heal the world. and thats how i try to teach. 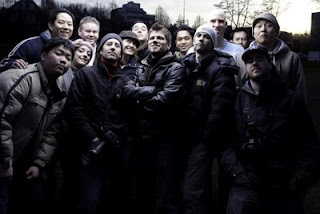 Our second ever Big Lights Far Away seminar took place the weekend of feb 6-8, 2009 in my home town of Vancouver. Special thanks to everyone who came out, you guys were amazing. We got some great shots this past weekend so check them out!